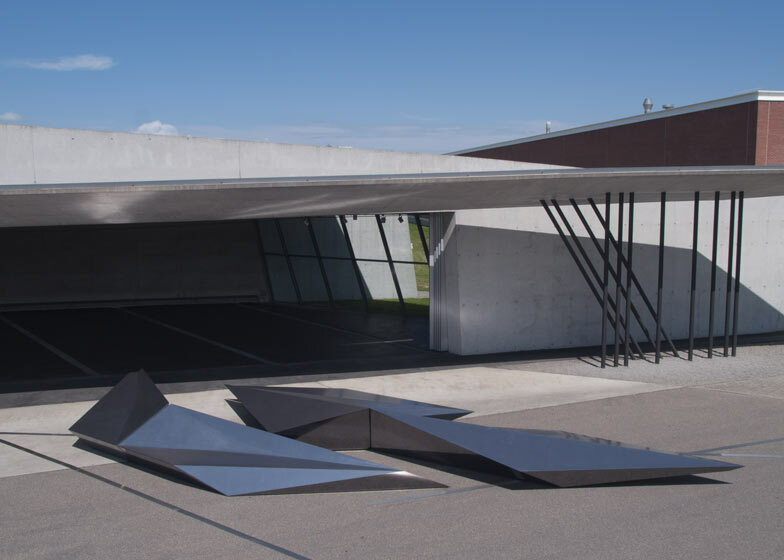 An angular installation by Zaha Hadid has been unveiled in front of the architect's Fire Station at the Vitra Campus in Weil am Rhein, Germany (+ slideshow). 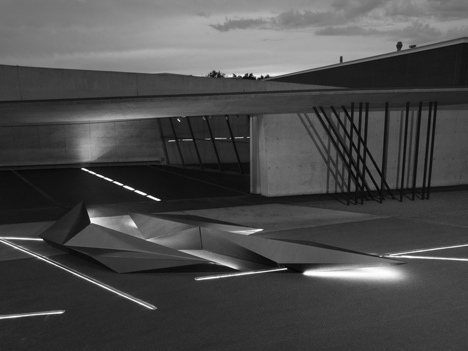 The work was commissioned by crystal manufacturer Swarovski to mark the twentieth anniversary of the opening of the Vitra Fire Station, Zaha Hadid's first completed building. Called Prima, it comprises five components that can be arranged in different configurations to create adaptable seating landscapes. Hadid's original drawings for the Fire Station were translated into three-dimensional fragmented forms to create the seating. Highly polished surfaces reflect the sky and the angles of the nearby building, while strips of LED lighting illuminate the structure at night. 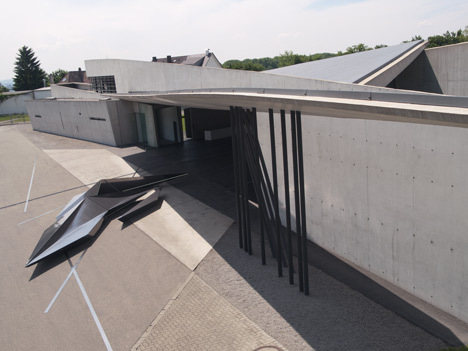 "I have a particular affection for Vitra Fire Station as it was my first building," says Hadid. "Returning to Vitra to work with Swarovski on this installation has been a very rewarding experience." Prima will be on show at the Vitra Campus in Weil am Rhein, Germany, from tomorrow until 11 August. 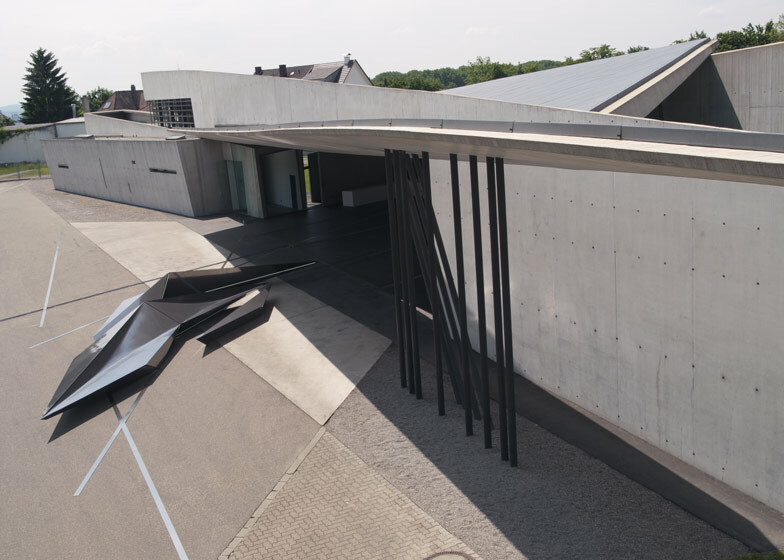 First established in the 1980s, the Vitra Campus has become well-known as an unofficial museum of contemporary architecture, including Herzog & de Meuron's VitraHaus showroom, the Vitra Design Museum by Frank Gehry and a conference hall by Tadao Ando. A SANAA-designed Factory Building is the latest addition, opened in April, and the building proposed for the site will be a children's art workshop by Chilean architect Ale­jan­dro Ar­ave­na. Zaha Hadid has recently proposed a masterplan for a site beside a lagoon in Izmir as part of Turkey's bid to host the World Expo 2020 and has also been appointed to design a stadium in Qatar for the 2022 FIFA World Cup. Photography is by Hélène Binet, unless stated otherwise. 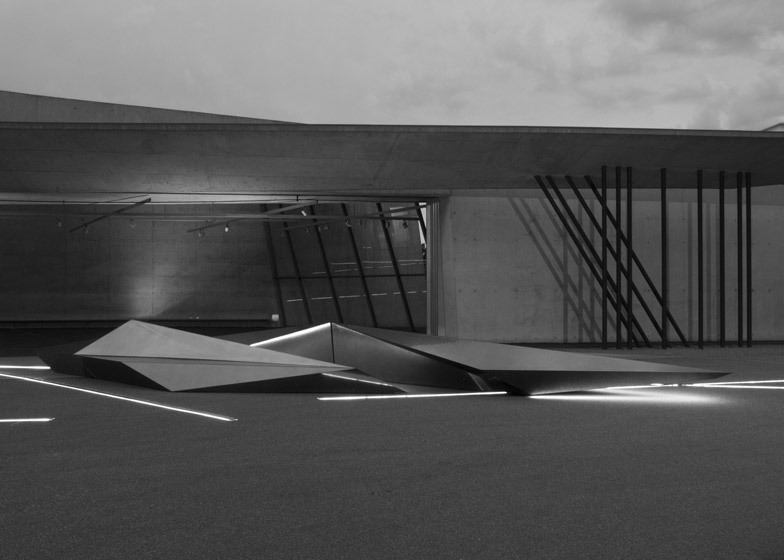 Swarovski has commissioned Zaha Hadid to create a celebratory installation marking the completion twenty years ago of her first major built project, the Fire Station at Vitra Campus, Weil am Rhein, Germany. 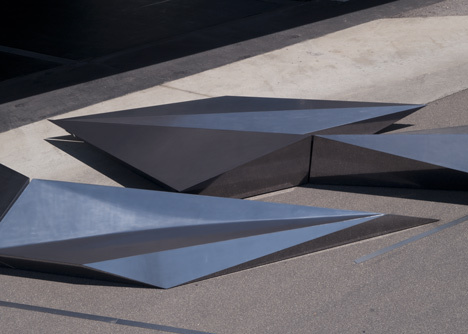 The installation, entitled Prima, is an angular piece made from five highly polished components that can be moved into different configurations. It will be installed in front of the Fire Station, reflecting and honouring the design process of the building. 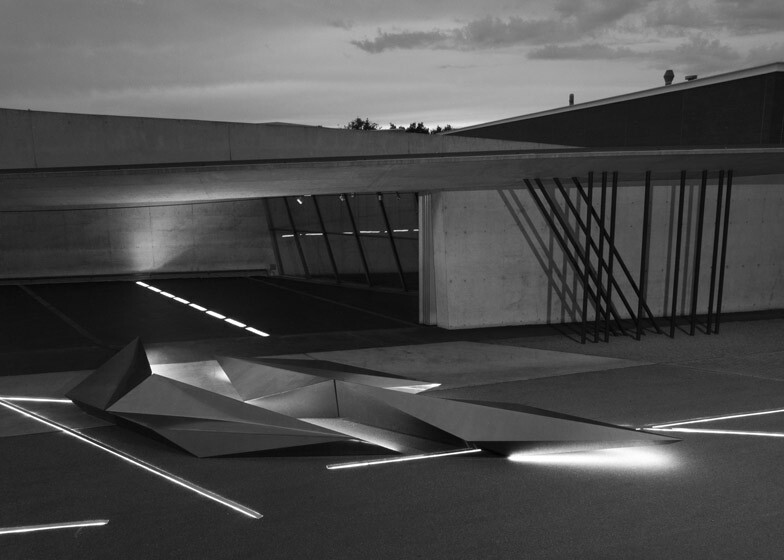 The project recalls the dynamism of Hadid's original drawings created for the Vitra Fire Station, exploding in three dimensions from the lines and planes of the paintings and sketches. Its reflective surfaces contain seating for visitors and are illuminated with LED technology. One of the world's most celebrated architects, Zaha Hadid was the first woman to win the Pritzker Prize, the most prestigious award in architecture. For years, her radical designs remained on the drawing board, but the turning point came in 1993 with the opening of the Vitra Fire Station commissioned by Vitra's Chairman Rolf Fehlbaum. 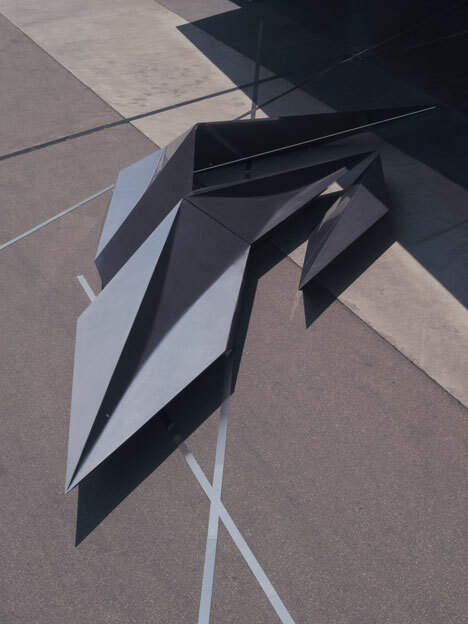 Painting formed a critical part of Hadid's early career as the design tool that allowed powerful experimentation in both form and movement - leading to the development of a new language for architecture. Hadid's interest in the concepts of fragmentation and abstraction is evident throughout her repertoire and continues to this day. 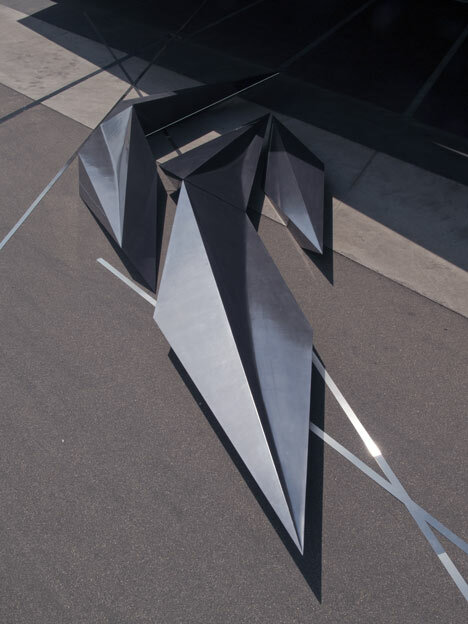 Originally engaging with the work of Kazimir Malevich, Hadid translated the warped and anti-gravitational space of Russian avant-garde painting and sculpture into her own unique architectural practice. Using the advanced design and manufacturing technologies available today, the facets of Prima are a direct translation of the dynamic two-dimensional lines and planes on the canvas, reflecting Hadid's detailed experimentation to perfect the Fire Station design. The installation continues this research, documenting Hadid's remarkable journey as an articulator of complexity: a 2D sketch evolves into a workable space, and then into a realised building. Zaha Hadid commented: "I’m equally proud of all my projects as they each represent different times of my career and periods of research, but I have a particular affection for Vitra Fire Station as it was my first building. Rolf Fehlbaum shares my passion for architecture and was inspired by my early visualizations. He dared to engage me without seeing a prior track record and without the certainty of public success. Returning to Vitra to work with Swarovski on this installation has been a very rewarding experience." 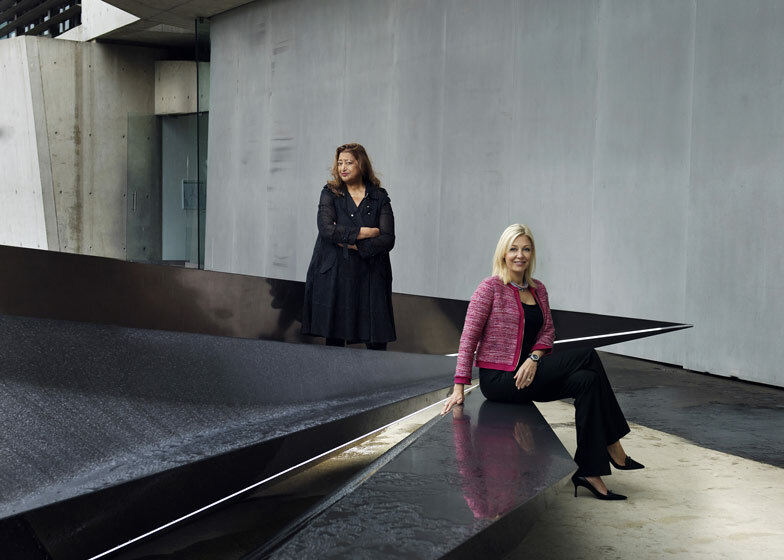 Nadja Swarovski, Member of the Swarovski Executive Board, commented: "Zaha is an astonishing force of nature who imparts her designs with power and grace in equal measure. It has been an honour to work with her once again on this exciting celebratory commission. Prima is a dramatic sculptural installation - half art, half furniture, and stunningly beautiful." Rolf Fehlbaum, Chairman of Vitra, said: "I am happy to have worked with Zaha Hadid at such an early stage of her dazzling career. Her Fire Station is a spectacular building and it looks as impressive now as it did when it was first built. Few other architects would have been able to transform a modest commission like ours into a masterpiece of contemporary architecture. Zaha has been able to do so, thanks to an incredible sense of space and a radically new vision of what architecture can represent." Prima by Zaha Hadid for Swarovski at Vitra Fire Station on the Vitra Campus, Weil am Rhein, Germany. Prima will be showcased outside the Fire station from 12 June to 11 August 2013. The installation can be viewed as part of the public architectural tours.